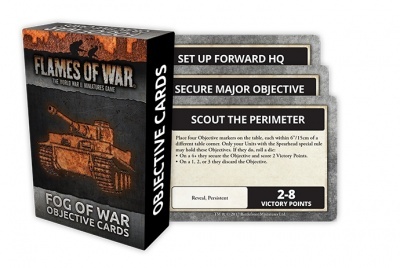 The Fog of War Objective deck adds a new mission to the game, creating an ever-changing game state where you may not know your opponent's plans right away. It allows you to play missions with objectives that vary from game to game, and can even change during the game. When capturing an objective in the Fog of War mission, you do not win right away, instead, you score victory points. The player who first hits the agreed victory-point goal wins.